A man facing an assault charge in connection to a vicious attack on a homeless woman on a New York City subway train claims she threatened him with a knife. The NY Post reports the court-appointed attorney for Marc Gomez made the claims at the 36-year-old’s arraignment early Sunday in Bronx Criminal Court. Gomez, of Yonkers, New York, had been arrested Saturday in connection to the March 10 encounter, which was caught on video and went viral. 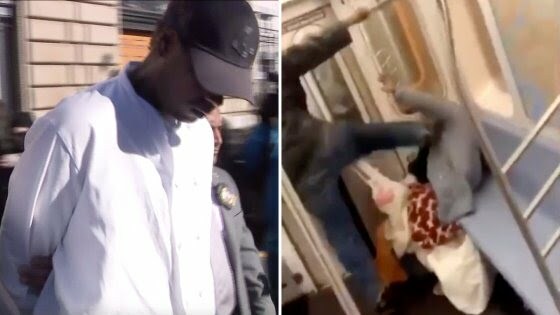 The clip showed the 78-year-old woman being repeatedly punched and kicked on a Bronx train around 3 a.m.
She left the train at the next stop and was treated for cuts, bleeding and swelling to her face and upper body. Shockingly, none of the bystanders intervened and instead just “oooh’d and ahhh’d” at the scene. No one called 911. And someone just stood around and videotaped!! !